From duck to denim to nylon Carhartt and Dickies premium winter wear offer the warmth, features, colors, and styles for on the job or off. A wide range of linings, sizes-including Big and Tall and prices. Dickies and Carhartt coats and jackets have extra features such as extra pockets inside and out, hooded styles, storm flaps, different lengths and some that are water repellent. Their vests have the same features and construction and can be worn alone or underneath the outerwear. The Extremes Coat from Carhartt is water repellent, and has a Cordura nylon shell for longer wear with an arctic weight polyester lining. The Carhartt Duck Vest is our most popular work vest. This zip front duck vest has arctic weight polyester insulation, two large front pockets, and an inside pocket with hook & loop closure. Longer tail for added coverage. Black or Carhartt Brown in regular and tall sizes to 5XL. 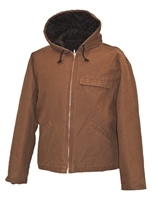 The Hooded Extremes Arctic Jacket adds a quilt lined hood and is a slightly shorter waist length water repellent jacket. Dickies Diamond Quilted Jacket has Dickies DWR water resistant and repellent finish to keep you dry. This is warm and lightweight vest with a rib knit collar and two front hand warmer pockets. Fabric: Shell: 100% hand washed cotton; Lining: 6oz quilted polyester insulation. Features: Attached hood with drawstring, front zipper, multi pocket design, rib knit storm cuffs, action back, and drop back.